At the beginning of the Twentieth Century the craze for the idyllic horse-drawn caravan holiday was sweeping across the leisured and professional classes of Edwardian Britain. For those who lived in industrialised towns and cities, taking a leisurely tour to remote parts of the country was promoted as an excellent way to improve health and be closer to nature. Founder of the WFL and owner of the caravan Charlotte Despard pictured to the left of the window in 1908. Courtesy of the Women’s Library at LSE. 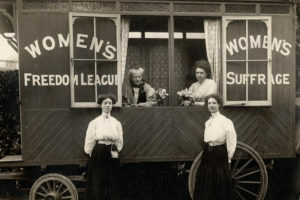 The growing popularity of leisure caravanning coincided with the peak of the Suffrage movement, a widespread campaign by numerous organisations who aimed to gain votes for women. The movement was often associated with militant Suffragettes with extreme protest tactics, such as breaking windows, which resulted in imprisonment and hunger strikes. Yet there were many Suffragists who sought a more peaceful solution to having their voice heard, and it was the caravan who offered an answer. Here we discover how the horse-drawn caravan revolutionised the way in which propaganda was spread to more remote communities during the campaign to gain voting equality. The party of the first 1908 NUWSS caravan tour made up of Newnham College, Cambridge students. Courtesy of the Women’s Library at LSE. The story of the caravan’s role within the Suffrage movement begins in 1908. The leaders of the Women’s Freedom League (WFL), a breakaway organisation of the militant Women’s Social and Political Union (WSPU), were seeking new ways to gain supporters. Suffrage networks were well established in the major towns and cities by this stage, but as you travelled deeper into remote and rural areas fewer people had been touched by the word of the cause. In May that year Australian Actress Muriel Matters and her party, representing the WFL, were the first Suffragists to take to the campaign trail in a caravan. Halting at towns and villages during their tour of Surrey, Sussex and Kent, the group held meetings with local residents which quickly proved to be a successful method of gaining support. The tour was deemed a great success in spreading the Votes for Women message beyond the Suffrage strongholds; this was in spite of some altercations with the locals possibly encouraged by the WFL’s more militant reputation. Later that summer the National Union of Women’s Suffrage Societies (NUWSS) were also inspired to take their word out on the road. In July 1908 a group of female students from Newnham College, Cambridge including Rachel ‘Ray’ Costelloe and Ellie Rendel travelled by caravan from Scotland to Oxford, using peaceful persuasion at meetings held en-route. When they had time away from the campaign trail they enjoyed their surroundings and took part in the daily chores like any seasoned caravanner. In August another NUWSS party set out in a caravan, this time from Whitby and across the North Yorkshire Wolds. These caravan tours were a testament to how the Suffrage movement was extremely creative in finding new methods of propaganda. 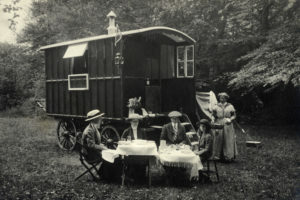 Pioneering holiday caravanners were often met with much wonder when travelling the roads, and being greeted by a group of Suffragists on board would have greatly added to the novelty. 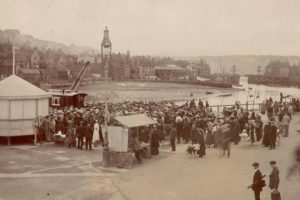 The second caravan tour taken by the NUWSS in 1908, showing a speech being made from the caravan in Whitby Harbour. Courtesy of the Women’s Library at LSE. Only a year before these first Suffrage tours, in the summer of 1907, The Caravan Club of Great Britain and Ireland was formed in response to the growing interest in caravanning for pleasure. What was striking about this organisation is that it boasted around one third of female membership, many of which were unmarried ladies. In comparison to the many exclusively male members’ clubs of the Edwardian era, The Caravan Club was extremely progressive in its attitude to sexual equality. The social constraints of the previous decade were cast aside, as groups of ladies increasingly looked to the freedom of the road as a means to enjoying healthful outdoor pursuits. It was extremely fitting that a hobby which welcomed women proved to be the perfect way in which to gather support for equality in the vote. All-female parties were a common sight at Caravan Club gatherings before the First World War. From the perspective of The Caravan Club, no reference can be found suggesting that the organisation provided any support or advice to the novice Suffragist caravanners. Founder of the Club J Harris Stone wrote widely on the pursuit of caravanning and all that touched it, but on the Suffrage campaign’s use of caravans he remains silent, perhaps choosing to avoid any association with politics. Yet with his extreme encouragement for women being central to caravanning life, you cannot help but think that he would look upon these Suffragist Gypsies with great admiration. 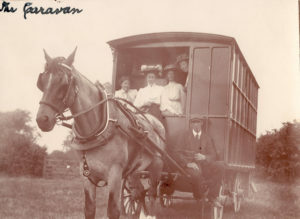 The 1908 caravan tours achieved many new members in the areas that were touched by the WFL and NUWSS, along with the setting up of numerous local branches of the organisations. Encouraged by these results a group of women from the NUWSS set out the following year for Leicestershire, Northamptonshire and Yorkshire. While the WLF had now acquired two caravans with Muriel Matters heading for East Anglia while another ʼvan travelled west from the Capital for Salisbury. From 1908 until the outbreak of the First World War the caravan proved its worth in being an important part of the Suffrage campaign trail.